With over 40,000 organizations using NetSuite, it is the world’s leading provider of cloud-based business management software for growing and changing businesses. NetSuite helps companies manage core business processes with a single, fully integrated system covering enterprise resource planning (ERP), financials, customer relationship management (CRM), e-commerce, inventory and more. NetSuite is 10 times larger than its closest competitor and provides an abundance of resources to its customers and consultants. As your business changes, whether through new busines models, acquisitions or spin offs, you can quickly and easily change your NetSuite business system. NetSuite's user dashboard displays real-time analytics of vital data, easily accessible reports and key performance indicators, so you can make smart business decisions. 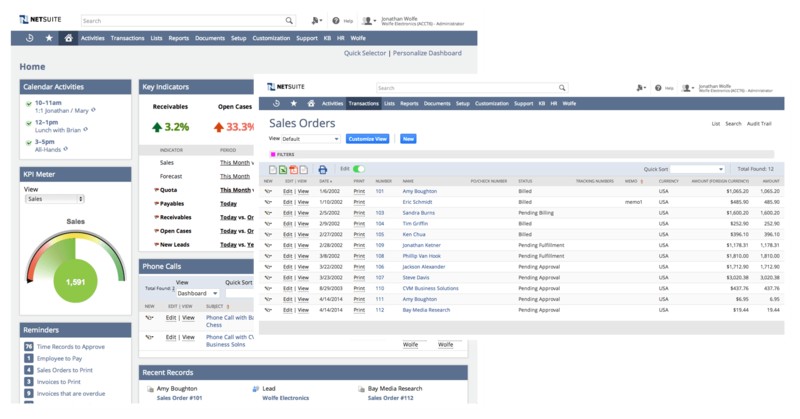 With a customizable, customer-specific commerce system, NetSuite goes beyond a financial management system to a commerce-ready ERP. NetSuite is cloud-based, mobile-enabled and has deep, feature-rich functionality that can adapt to the most complex business challenges. NetSuite is a versatile software with solutions for CEOs, CFOs, CIOs and controllers in a wide range of industries. At Kraft Enterprise Systems, we have particular expertise in implementing industry-specific functionality for growing and middle-market companies in the following industries. With our indepth knowledge of the software we can offer customized modules (SuiteApps) to enhance your NetSuite experience and help you better manage and grow your business. "Kraft Enterprise Systems team was very responsive, and their level of support was outstanding. Considering 80-90% of IT projects don’t come in on time or on budget, it was a very pleasant result that they did both." "Kraft Enterprise Systems was 100% ‘on my team’ the entire way and saved us countless hours post integration with their excellent training and straightforward solutions." “Our change to NetSuite wasn’t necessarily complex, but we were on a very short, three-month timeframe for initial implementation. The Kraft Enterprise Systems team made the deadline in a seamless way." “I would highly recommend KES. I’m not sure how far we would’ve gotten without them. They are very patient and helpful — anyone thinking about NetSuite should contact them"